To beat your competitors, you must first know how strong or weak they are and what they are doing. 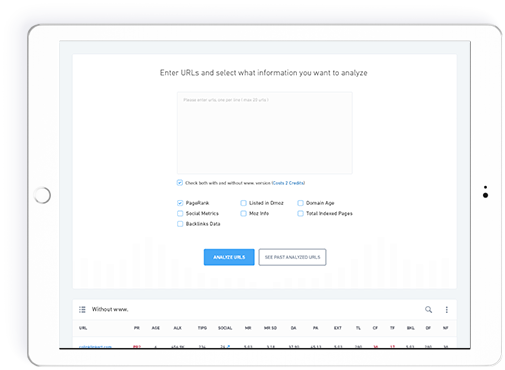 With 'Bulk URL Analyzer', you can analyze multiple URLs at once (your own sites, the sites of your clients, the sites of your competitors, aged domains you are considering buying...) and compare their SERPed Rank, domain age, Alexa rank, number of pages indexed in Google, number of social signals, Moz Rank, Moz Domain Authority, number of links, number of dofollow links, number of nofollow links, number of .gov links, number of .edu links... On Auto-Pilot, in just a few seconds. Doing this yourself would take you hours of work... A lot of people don't do it at all, because it's too time-consuming. This is a huge mistake and can be a lot easier if you have access to the right tool!Another powerful use for the 'Bulk URL Analyzer' that we use it for every day is buying quality aged domains. We find sites selling domains, or brokers with lists of domains, and we simply paste them into the 'Bulk URL Analyzer' tool, 20 at a time, to see at a glance which have great potential, and which are junk. This is a super fast way to avoid wasting money on junk domains, and save hours of research time too.